Architect: HKS, Inc + EVS, Inc.
LS Black transformed the six acre site across from US Bank Stadium into a community gathering space that connects to the City’s main lines of public transportation. The downtown east pedestrian bridge then acts as a main connection for event goers into the US Bank Stadium. 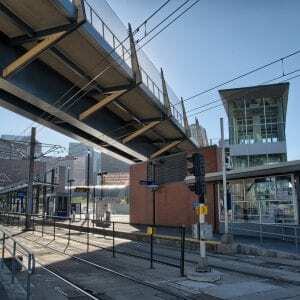 The team worked hand-in-hand with the City of Minneapolis, Hennepin County, and Metro Transit to coordinate work around traffic, bus routes, and the LRT. Work began in the spring of 2016, with the removal of the existing concrete and paving. Prior to work beginning the team worked with the City to locate all underground utilities for relocation, including: power, fiber optics, and storm sewer. Work also included demolition of the existing sidewalks, soil excavation and importation, installation of the new StrataVault system, and new concrete. Special care was taken to reroute pedestrian traffic and coordinate work amongst three other major projects happening simultaneously around the site.